I’m really pleased to welcome Ann Bennett today. 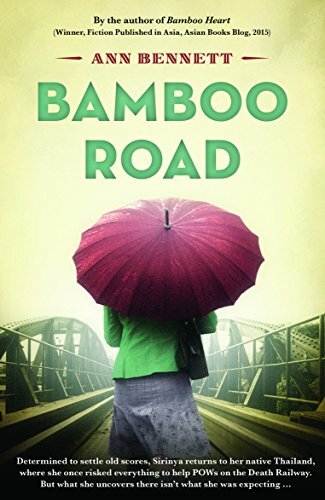 Her latest novel is Bamboo Road, the third of her trilogy of books set in South East Asia during World War 2. Although the third book, the trilogy can be read in any order. She has written a great post about Kanchanburi, the setting for Bamboo Road and included some brilliant photos to really set the scene. Kanchanaburi in Thailand, the setting for Bamboo Road and Bamboo Heart, home of the Bridge on the River Kwai, was the headquarters for the building of the Thai-Burma railway. It is a lively, picturesque town in a huge valley surrounded by jungle-covered mountains . I have been there four times, travelling from Bangkok on the railway, which still runs from Bangkok as far as Nam Tok a journey which features in both Bamboo Heart and Bamboo Road. When I first discovered Kanchanaburi in 1988 I had no idea that one day I would write about it, but all my visits, and my diaries from those trips, have provided ideas for my books. That first trip was with my mother. We wanted to see the place where my father had been a prisoner on the Thai- Burma Railway. Mum and I walked over the Bridge on the River Kwai, of course. We visited the war cemeteries, and the only museum that was there then, the JEATH museum, a quirky place run by a Thai monk (renamed as the DEATH Museum in Bamboo Heart). It is housed in atap huts, replicas of those the prisoners would have lived in. The old part of the town contains streets of elaborate old shophouses. One of these is where Boon Pong lived in 1942. He was a member of the Thai underground and the inspiration for Chalong in Bamboo Road. The countryside around the town is spectacular; not far away are the beautiful Erewan waterfalls, and limestone cave temples – Wat Tham Mangkon Thong, the basis of a couple of important scenes in Bamboo Road. A few kilometres north is Chungkai war cemetery, where once Chungkai camp stood on the banks of the river, and Chungkai cutting, where my father must have worked. This is an amazing and evocative place. Here you can see the marks where the prisoners chipped out the rock by hand. Chungkai is an important setting in both Bamboo Heart and Bamboo Road. A view of the Tenasserim Hills, where Sirinya’s grandmother lives in Bamboo Road. Chungkai cutting- setting for both Bamboo Heart and Bamboo Road.